How to produce Rosy Adenium? 2. Can we use other Rosy Adeniums instead of “Dox Xon”? - Yes, you can. 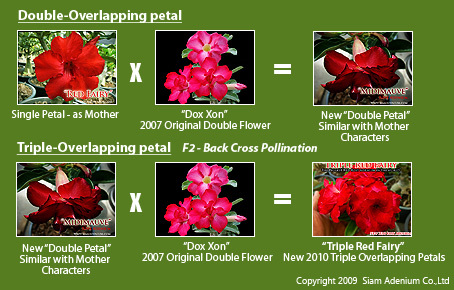 Mostly I like to use “Dox Xon” because her cultivar is pretty stable, not made much more change flower character of single petal adenium’s mother itself. 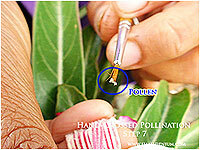 I used to switch to put pollen from single petal Adenium in Rosy Adenium : Dox Xon or others and found that the flower styles are almost the same as original Rosy Adenium mothers, not come up with many styles but you can get more about 40% become Rosy Adeniums. That’s why I don’t like to do with this way. 3. Now we are success with making Rosy Adeniums but they are not so nice or colorful flowers just plain Rosy Adenium. 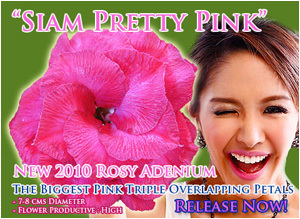 How can we produce better looking and more attractive Rosy Adeniums? - The answer is very simple. First, you have to have very nice and attractive single petal adenium in your pocket. 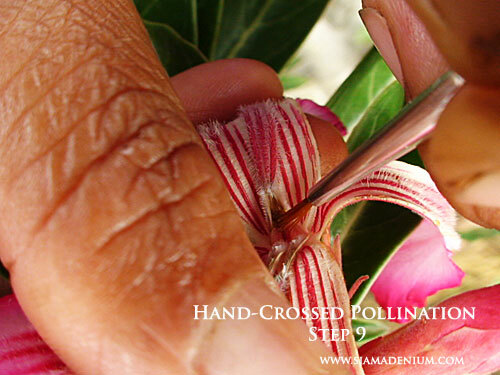 This is a key to success of making nice Rosy Adeniums. We have started producing many single petal adeniums since 2005 and until now we have over 200 different flowers. That means if you have big pocket with full of nice single petal adeniums so you can also produce many nice Rosy Adeniums with many attractive styles. We have a lot of many single petal styles so that means we have many choices to choose single petal adeniums in order to do crossing with Rosy Adenium. We always imagine what final flower outcome would be before start crossing each other. Please remember, the key of success with making attractive Rosy Adenium is nice Single Petal Adenium itself, not Rosy Adenium.